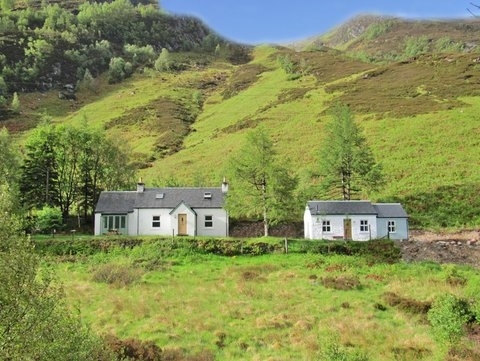 The Byre is a romantic and cosy self-catering cottage, close to Glencoe and Fort William, nestled above Loch Leven and looking out over the Mamore Ranges. 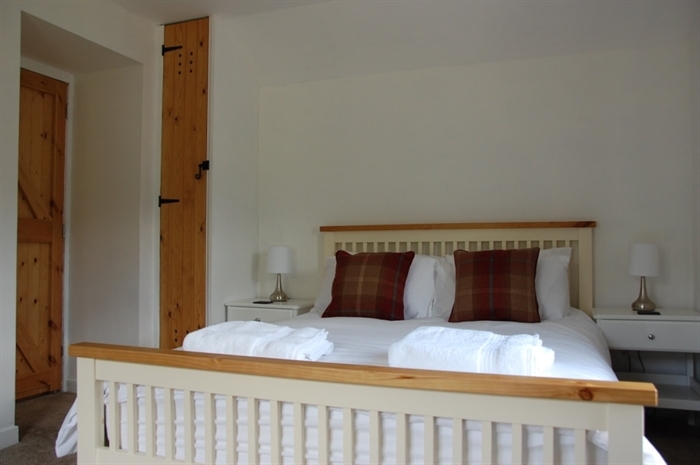 The flexibility of a whole cottage, but for short stays if that suits you best, and for as many nights as you wish. With gorgeous views, the Byre is a perfect romantic hideaway, retreat space or base for outdoor sports and sightseeing. Contact Chris & Sarah or visit our website to book directly. 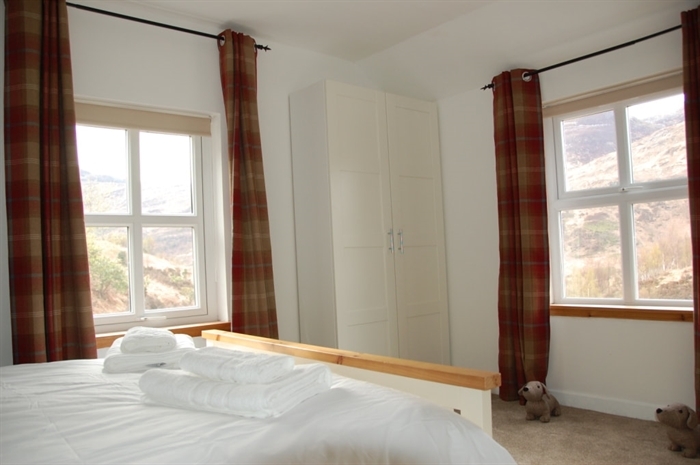 From the bedroom, you can look out over the mountains on two sides and enjoy the wonderful panorama views for miles around. Early in the morning, wild deer, including stags, hinds and fawns can often be seen grazing on the grassy hillside in front of the cottage. The stable door leading into The Byre opens onto a living room and dining area with exposed beams and a vaulted ceiling. 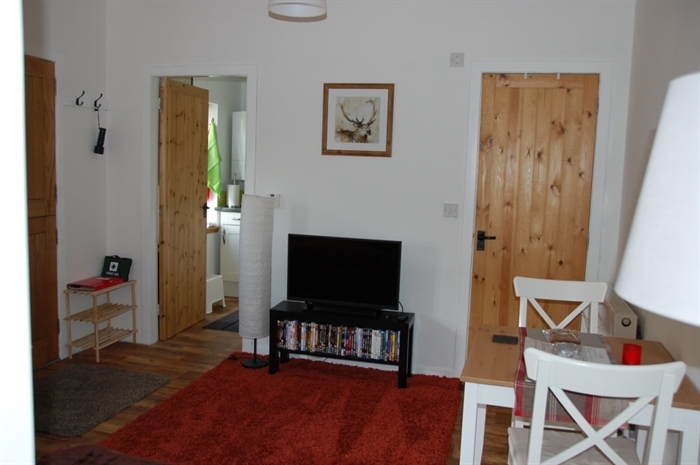 The room contains a sofa, TV and DVD player, table and chairs. 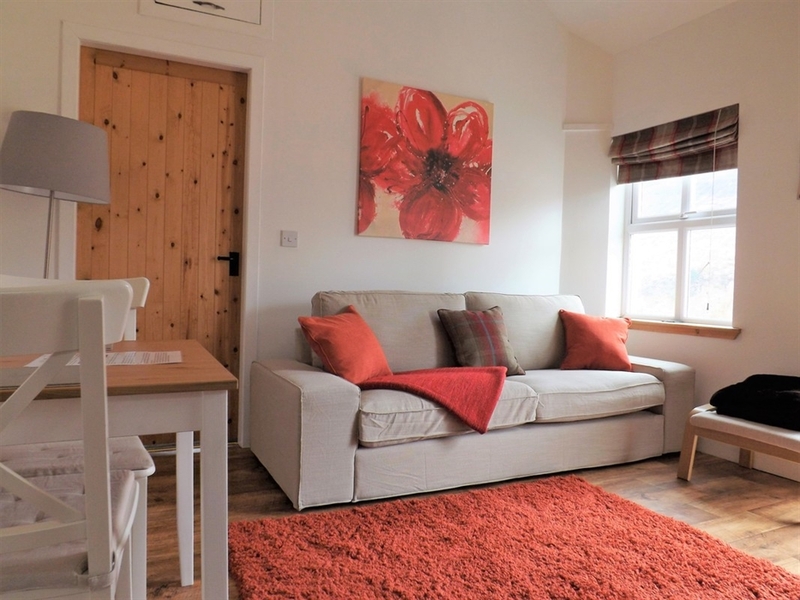 Off the living room is the well-equipped kitchen with a cooker and hob, fridge freezer, microwave and a good selection of pots, dishes, plates, glasses, cutlery and other utensils. The tiled bathroom finishes off the lovely space with a luxurious double shower, a full rainfall showerhead and a skylight Velux window that floods the room with light. The cottage has fast internet connection through a broadband router. 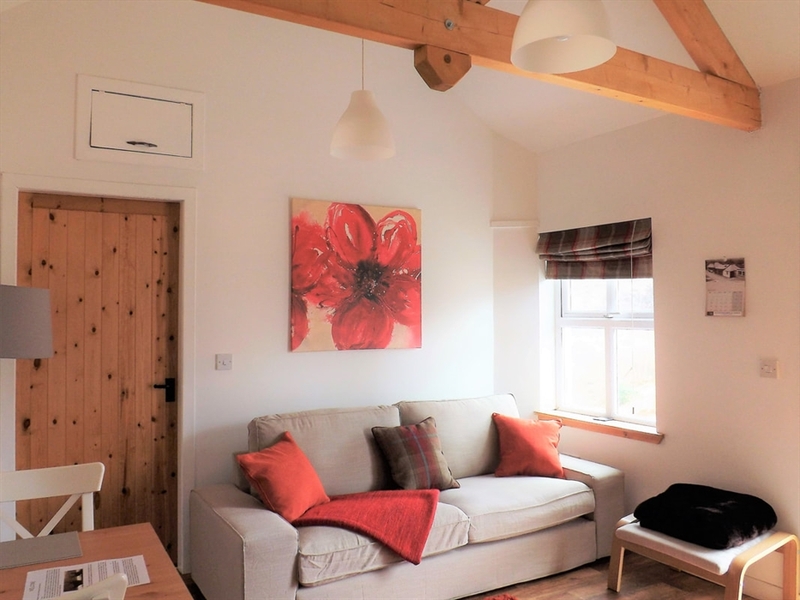 The Byre is pet friendly and available to book on a weekly basis from May to September and for shorter stays from October to April. There is a key box entry system for the Byre, so you can let yourselves in on arrival. Chris and Sarah, the owners, live nearby in the village of Onich, about 10 miles from the cottage, so if you have any problems, we are on hand to help out. 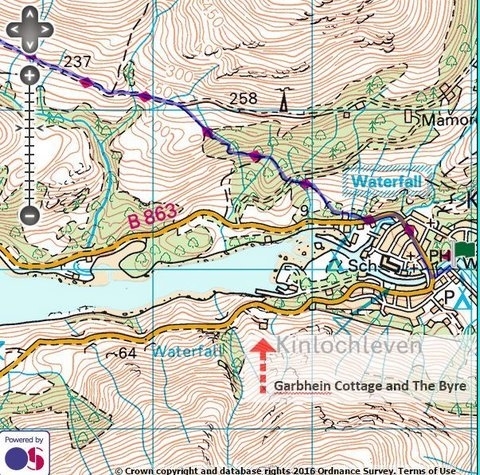 Kinlochleven is only a half mile away and has a number of pubs that do excellent bar food. There is a well stocked Co-op supermarket and for a bigger shop Fort William is about 30 minutes away by car and has a full range of shops and services. Kinlochleven is also home to 'The Ice Factor', the worlds largest indoor ice-climbing wall, and the Ice Factor has a number of other indoor and outdoor climbing activities for all ages. It's a wonderful place, well worth a visit, whether active or not! 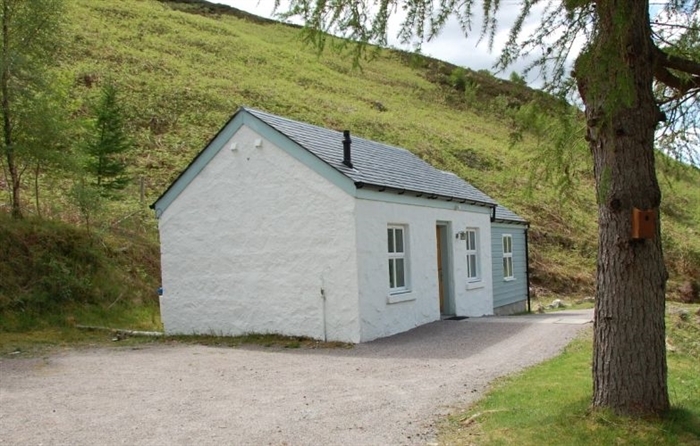 The Byre is best accessed by car, but it is also on the Fort William-Kinlochleven bus route, bus No 44. The water supply is mountain-fed from nearby streams and filtered and purified with a high tech UV system. The water is of course safe to drink and regularly inspected to ensure that it meets government safety standards. Check-in is after 4.00 pm and checkout is 10.00 am.